Each summer, the Council offers an intensive workshop on the Holocaust to teachers in all levels and subjects. The Workshop discusses interdisciplinary methods for teaching and learning about the Holocaust in the context of the South Carolina standards by offering content knowledge about different facets of WWII and the Holocaust, suggestions for age-appropriate approaches to teaching about atrocities in different contexts, and strategies for connecting historical thinking across subjects, time periods, and disciplines. This year, we partner with Facing History and Ourselves to offer a three-day workshop on The Persistence of Hate: Exploring Antisemitism and the Holocaust. During the course, participants will utilize online and in-person learning methods to better understand how antisemitism factors into beliefs and actions both then and now. We also provide a special focus on learning about Jewish life and culture, especially South Carolina-related resources on the contributions of Jewish South Carolinians. Participants are also required to complete a series of online preparation modules prior to attending the course. In-person classroom instruction from July 16-18, 2019 in Columbia, SC. Participants must complete all three segments, including all sessions on the days of the in-person workshop, in order to receive credit. This course is limited to SC-certified teachers who have a current teaching contract with a school in South Carolina. Pre-service teachers may be considered with the permission of the executive director if there is room. The course is capped at 25 teachers. To download the 2019 application, please click here. A registration fee of $125.00 is due at the time of application. (The registration fee is only $100 for those who apply by April 15th ). A $50 application fee will be charged separately by USC in order to register within the university distance learning system. This cost will be reimbursed to educators who complete the workshop in its entirety following course completion. The remaining cost of the course, including the cost of graduate credit, is underwritten by the South Carolina on the Holocaust. Two nights of lodging will be provided by South Carolina Council on the Holocaust to teachers traveling from more than 50 miles outside of Columbia,SC. Breakfasts and lunches will be provided by the Council on the three course days. Dinners will be the responsibility of the participants. No additional travel stipend will be provided. The deadline to apply for the workshop is May 31st. Please note, in addition to the application, participants must complete their USC online enrollment no later than Friday, June 14, 2019, to ensure the University has sufficient time to enroll them in the system. To pay your registration fee online via paypal, a 3% convenience fee is added (see amounts in the dropdown below). The South Carolina Council on the Holocaust Teacher Advisory Committee Presents its 14th annual professional development day on October 18, 2019. Stay tuned for more information, including registration information and scheduling. Every other year, the South Carolina Council on the Holocaust sponsors a trip to Eastern Europe so that educators and the general public can gain a deeper understanding of authentic sites of the Holocaust. 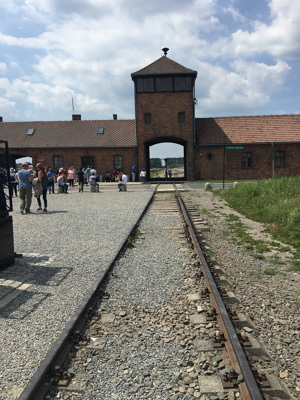 The trip concentrates on sites in Poland, including the Memorial Museum at Auschwitz-Birkenau and the neighboring town from which the concentration camp got its name, Oswiecim. Participants also visit important places of Jewish culture, such as Kazimierz, the former Jewish quarter of Krakow. Each year, the trip adds an additional location to help show the scope of the Holocaust across the European continent. In 2019, the trip includes a weekend in Amsterdam with a special visit to the Anne Frank House. The trip is open to everyone; however, educators have a special funding option: The first ten SC-certified educators with current contracts to teach in the state of South Carolina are eligible to receive a $1000 subsidy to offset the costs of travel. The study trip cost for 2019 was $2485 plus airfare. Registration for the 2019 trip is now closed. The next trip will take place in 2021.